I’m glad to report that the long anticipated sequel to Brigid Kemmerer’s Storm does not disappoint in the least! Spark is a whirlwind adventure full of action and intrigue, and a sweet romance. I love the idea of following the same group of characters for a series, but telling each book from a different point of view. While I loved Chris when I was reading Storm, I was burning with curiosity about his brothers, and am glad that Spark gave me the opportunity to get to know Gabriel, who is possibly the most misunderstood of the Merrick brothers. Gabriel, whose element is fire, is literally all fire and heat – quick to anger and difficult to control, but steadfast in his ways and incredibly romantic. In some ways, I liked Gabriel more than Chris, because I empathized with him more. The love story in the novel burns hot – I loved every interaction between Layne and Gabriel and couldn’t enough of them. Layne doesn’t let the jock push her around and stands up to him admirably, while simultaneously unlocking parts of Gabriel I doubt he even knew existed. I like Layne more than Becca, simply because I have more in common with her. She and Gabriel are a very cute couple, and I loved them. They also made an effort with each other’s families – Layne got to know the Merrick boys and Gabriel is amazing with Layne’s younger brother, which is incredibly sweet in my opinion, and shows the strength of their love more effectively than any make out scenes! The plot of Spark is thrilling and kept me guessing until right at the end. I had a few theories, but they kept changing until I was just dying to know what was going on, and when everything was revealed I was left reeling. I’m not sure if I completely missed some obvious clues, but I thoroughly enjoyed being in the dark and guessing, and love Brigid’s brilliant writing for providing that. 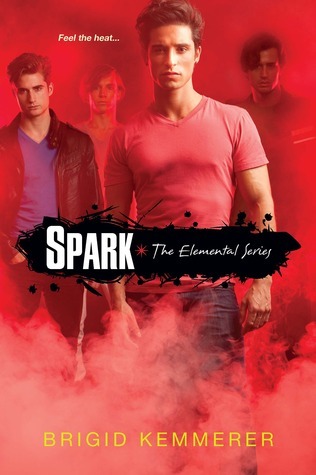 A wonderful and explosive addition to the Elemental series, I think Spark is in many ways better then Storm and shows the growth of Kemmerer’s writing. I highly recommend this series to those who enjoy YA and elemental magic, as well as those who are looking for a quick, entertaining read. 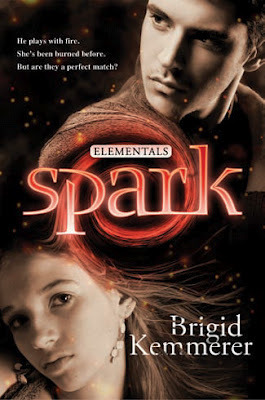 I’m on the Australian blog tour for Spark – stop by on October 1st for my interview with Brigid.